As I write this post, it is making me sad. Why? When I was in Syracuse for a business trip awhile back, we ended up eating at Erawan Thai Restaurant. It was a random pick, but a good one. My colleague ended up ordering the Nam Prig Ong, and by golly, it’s the best thai dish I’ve ever eaten in my life. Ever. In my life. Yes, I said it. And I’ll say it again. It’s the best thai dish I’ve ever had in my life. 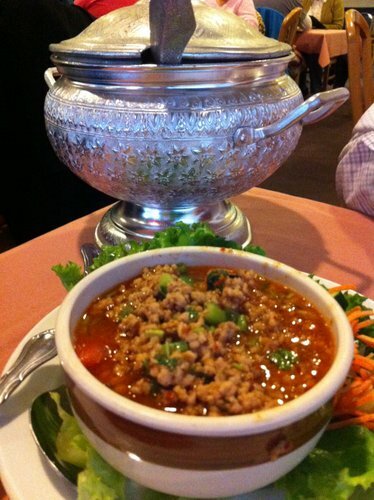 However, there is no thai restaurant near me that serves this dish. WHY THE HECK NOT? I have no idea. But it saddens me to think about it, because I know I can’t order it. Yes, I can attempt to make it, and some day I will, but it nevertheless disappoints me that it’s not possible for me to walk into a thai joint around here and order this dish. Oh, the sadness. It was sweet, savory, spicy, and when eaten with rice, it was the greatest thing in the world. Both of us couldn’t stop eating it. And ever since, we can’t stop talking about it. Seriously though, we talk about that dish all the time. It’s like a sickness. Yet I get sad knowing I can’t have it anytime soon. Does anybody know somewhere in the tri-state area I can find this? If so, I will be your greatest fan forever.